Cruising the Gordon River on the purpose-built Spirit of the Wild, you experience quiet cruising under the power of the vessel’s electric motors. Cross Macquarie Harbour to Hell’s Gates, the narrow entrance into the Southern Ocean. You then cruise to the Gordon River, where you give yourself the best chance of seeing the famous reflections while on board Spirit of the Wild, the first cruise boat on the river each day. Step ashore at Heritage Landing and walk through rainforest to see ancient Huon Pines. Step ashore again at Sarah Island, a 19th century penal colony, hearing stories of the convicts who laboured there. Local guides enhance the tour with interpretation on the region’s history. Seating is allocated to each guest. The main deck offers two seating styles – Main Deck Central and Main Deck Window. All are spacious and comfortable and include a delicious lunch that showcases Tasmanian produce. On board the 11-person MV Sophia, this three-hour cruise gives you the opportunity to explore the convict past of Tasmania's West Coast. You will visit Tasmania's Sarah Island, where you will disembark at this historical and once dreaded penal colony, which was also the largest boat-building settlement in the British colonies. Take a guidebook and embark on a self-guided tour among the ruins and discover more about what life was like for convicts, soldiers, settlers and shipwrights who lived and worked there. Dureation is three hours, departing at 1100 daily, subject to weather conditions and numbers. Note that cruises will only run with four or more passengers. In just one hour, groups of four or more are invited to discover the bays around Strahan on the MV Sophia, with the benefit of an expert local skipper. Mill Bay is home to old and new boats, some with a significant history. On some days the reflections from the boats in the still waters make for great photographs. Next stop is serene and peaceful Lettes Bay. Here the old Queenstown miners' shacks have become quirky holiday homes, complete with tranquil waters and beautiful scenery. Duration is one hour, departs daily. Note that cruises will only run with four or more passengers. 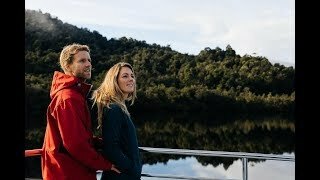 The award-winning Gordon River Cruise departs from Strahan and takes guests into the Tasmanian Wilderness World Heritage Area. Cruising the Gordon River on the purpose-built Spirit of the Wild, you experience quiet cruising under the power of the vessel's electric motors. Cross Macquarie Harbour to Hell's Gates, the narrow entrance into the Southern Ocean. You then cruise to the Gordon River, where you give yourself the best chance of seeing the famous reflections while on board Spirit of the Wild, the first cruise boat on the river each day. Step ashore at Heritage Landing and walk through rainforest to see ancient Huon Pines. Step ashore again at Sarah Island, a 19th century penal colony, hearing stories of the convicts who laboured there. Local guides enhance the tour with interpretation on the region's history. Seating is allocated to each guest. The main deck offers two seating styles - Main Deck Central and Main Deck Window. All are spacious and comfortable and include a delicious lunch that showcases Tasmanian produce. The third option is the Premier Upper Deck, including complementary lunch, morning and afternoon tea, open bar and exclusive viewing deck.